Definition at line 15 of file xtrcrypt.h. Definition at line 44 of file xtrcrypt.cpp. 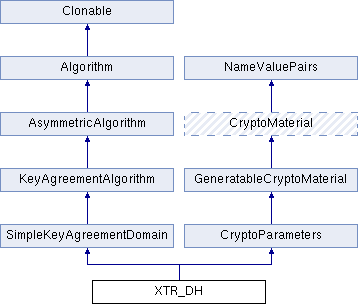 Definition at line 72 of file xtrcrypt.cpp. Definition at line 81 of file xtrcrypt.cpp. Definition at line 29 of file xtrcrypt.h. Definition at line 30 of file xtrcrypt.h. Provides the size of the private key. Definition at line 31 of file xtrcrypt.h. Provides the size of the public key. Definition at line 32 of file xtrcrypt.h. Generate private key in this domain. Definition at line 90 of file xtrcrypt.cpp. Generate a public key from a private key in this domain. Definition at line 96 of file xtrcrypt.cpp. The other party's public key is validated by default. If you have previously validated the static public key, use validateStaticOtherPublicKey=false to save time. Definition at line 104 of file xtrcrypt.cpp.